ACCEL aims to set a path to the next phase, such as company R&D, venture start-up and other public funding, based on the outputs of the Strategic Basic Research Programs (CREST, PRESTO, ERATO, etc.) that have the potential to be world-leading but cannot be continued by companies and other organizations due to their perceived risks. The Program Manager (PM) leads research and development with the innovation requirements and goals, demonstrating Proof of Concept (POC) and promoting the appropriate rights arrangements. * However, in the event that POC has been completed and it is regarded that the R&D results can be passed on to companies at an early stage, the R&D project may be brought to completion quickly. Furthermore, in the event that on the other hand it is judged through interim evaluations etc. that there are no prospects of POC being achieved or the results of the R&D are unlikely to be able to be passed on to companies the same measures may be taken and the project halted. 1. Significant and world-leading R&D results must be shown. 2. The results obtained through the Strategic Basic Research Programs must be developed, and a vision described in which the expectations of society are met, and links created that will lead to improved industrial competitiveness and international development, and changes to society itself. 4. The R&D plan must be able to concretely provide POC to companies and investors. 5. It must be demonstrated that even after ACCEL personnel are being fostered to continue the R&D, that there is an exit leading to corporate collaboration and the launch of ventures etc., and that there are prospects for the R&D leading to the securing of global personnel. * The results of R&D obtained through ACCEL must aim to be high-impact results that both surprise and attract companies and investors. The screening of matters regarding ACCEL will be conducted by an R&D Management Committee consisting of external experts etc. The specific roles of the Committee are as follows. 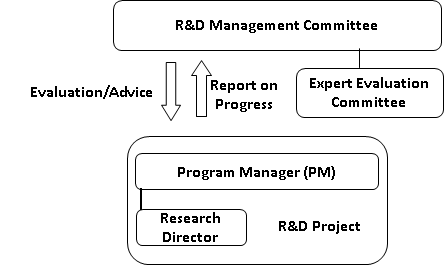 It should be noted that in order to contribute to making judgments regarding the above-mentioned roles the R&D Management Committee may set up other expert evaluation committees consisting of external experts. Members Masahiko Ichie President & Representative Director, Skymark Airlines Inc.
Hiroshi Okajima Principal Fellow, TOYOTA CENTRAL R&D LABS., INC.
Kazuhiko Toyama Managing Partner, Industrial Growth Platform, Inc. Under the ACCEL program a PM and Research Director work together on each R&D project, directing the overall R&D team (R&D project) including the joint researchers and participant companies, and taking responsibility for promoting the R&D towards its ultimate POC. The PM and Research Director bring together a team that will be adequate and optimal in order to reach its goal. The PM will at appropriate intervals report to the R&D Management Committee and JST on the progress and results of their projects, and deal with the evaluations and advice provided as a result of their reports.